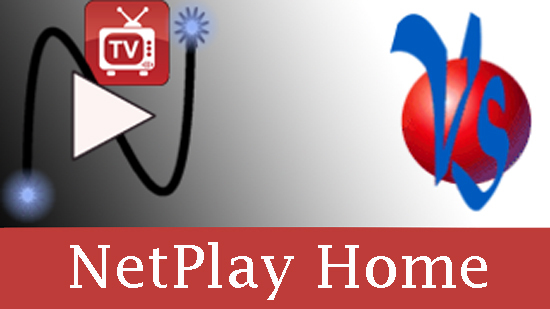 NetPlay TV is the Android software app that is used at every TV in a NetPlay Home installation. NetPlayTV app runs on devices either Android or Android TV OS (5.1.1 or later). See recommended list of devices. 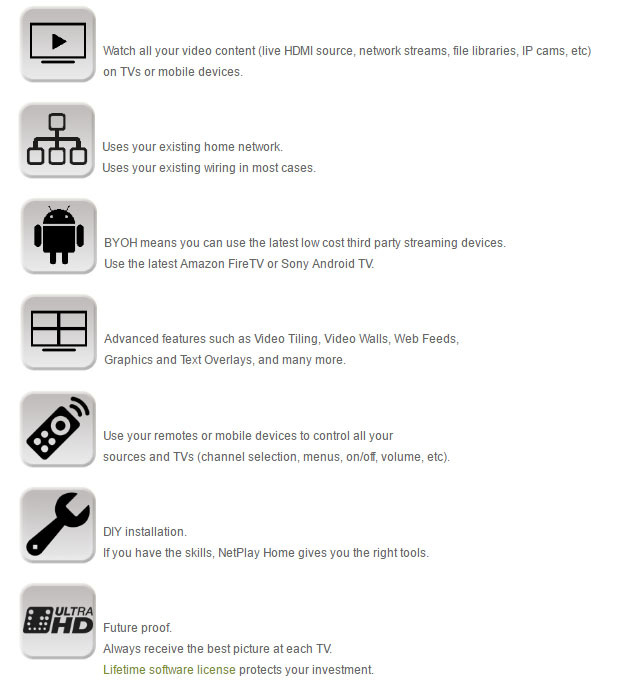 Because NetPlay Home is a BYOH system, you can use the Android streaming media box of your choice at each TV. Because your NetPlay TV licenses are bound to the NetPlay Manager, you can change Android streaming boxes at any time without changing your licenses. 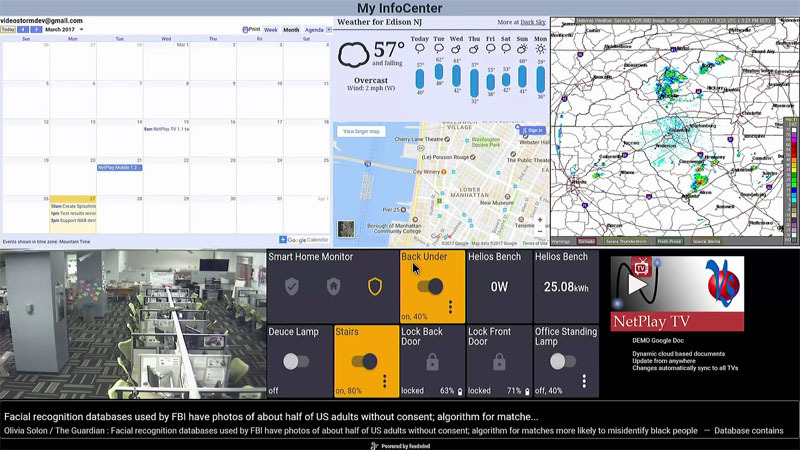 If you have a Sony or Sharp TV running Android TV OS, you do not need an external streaming box for that TV (NetPlay TV app will run natively on the TV). For other TVs, we recommend Amazon Fire TV or nVidia Shield as the external Android streaming media box in wired Ethernet mode. 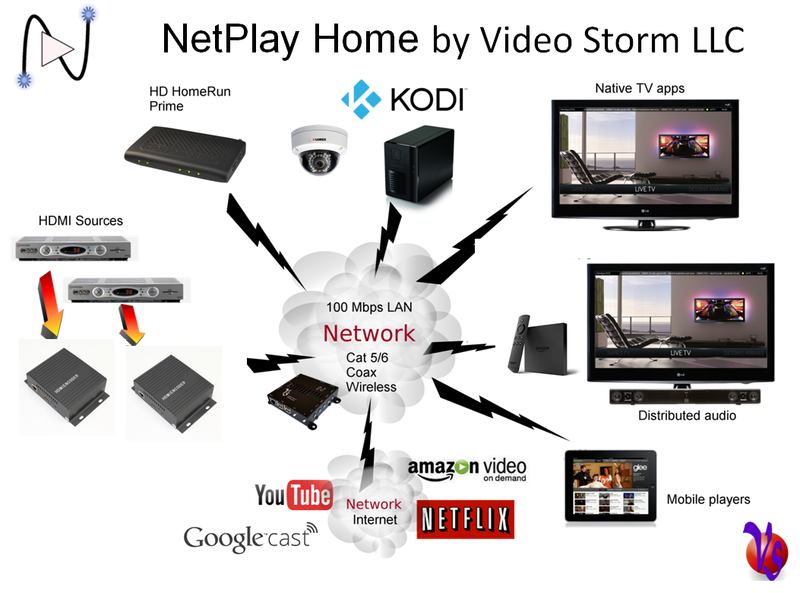 NetPlay TV software application supports the following features. All NetPlay licenses are tied to the NetPlay Manager (NVMM) hardware in your system. When you receive NetPlay Manager, please complete the software registration in order to bind your new NetPlay licenses to your NetPlay Manager. NetPlay TV and NetPlay Mobile licenses are perpetual lifetime licenses. New releases with new features may require additional payment to enable the new functionality. However, there is no requirement to purchase these new features in order to continue using your software licenses (without the new features). 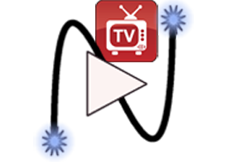 Licenses are not attached to individual Android streaming media boxes or TVs. Your NetPlay Manager will verify if you have sufficient licenses for the number of sink devices you enable in the system. This means you can easily swap Android streaming media boxes without changing your licenses. Licenses may be transferred between NetPlay Manager hardware in the case of hardware failure. Otherwise, the binding is permanent. Inside the hardware warranty period, hardware failure license transfer is performed free of charge. In other cases, there is a small charge for this service. In all cases, the NetPlay Manager hardware you are transferring from must be surrendered to Video Storm LLC. Licenses may be refunded within the return period for the NetPlay Manager hardware they are assigned to. If the NetPlay Manager is outside its return period, the NetPlay licenses are no longer refundable. The NetPlay Manager hardware must be returned to Video Storm LLC in order to refund the NetPlay licenses. For each system, purchase a NetPlay Manager (NVMM). In conjunction, you need to purchase NetPlay TV licenses corresponding to this device in the same online purchase order. A single order of NVMM and NetPlay TV lienses cannot be split between multiple systems. If you are just adding more NetPlay TV licenses to an existing NetPlay video system, you can purchase the additional licenses for the same system in a single new order. Please make sure you already have the NetPlay Manager (NVMM) as you will need it to register the new NetPlay TV licenses.